Thank G-d (-and Women and Rabbis) for Shabbat! "Remember the Sabbath Day, to keep it holy. Six days you shall labor and do all your work; but the seventh day is a Sabbath unto the Lord your G-d. On it you shall not do any manner of work -- you, your son, your daughter, your man-servant, your maid-servant, your cattle, and your stranger that is within your gates. For in six days the Lord made heaven and earth, the sea and all that in them is, and rested on the seventh day; wherefore the Lord blessed the Sabbath Day, and hallowed it." Shabbat was the day that Hashem (G-d) rested after creating the world in six days, as written in the book of Breisheet (Genesis) of the Torah. We emulate G-d by resting on the seventh day, and ushering in a holiness that is not present in the same manner the rest of the week. Shabbat is meant to be a day of connection to G-d, spiritual joy, and rest, as in "stress-less" relaxation for our souls. 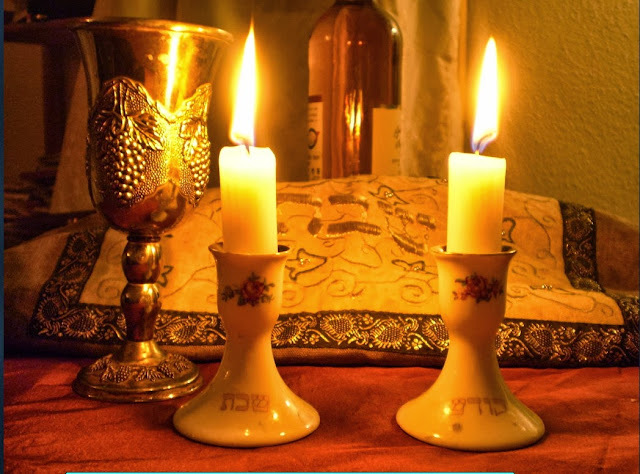 In order for it to be a day of "light," we bring in the Shabbat by lighting two (or more) candles, traditionally one for each of the commandments to 1) keep the Shabbat, and 2) remember the Shabbat (in Hebrew, "Shamor ve-Zachor"). The custom of lighting candles with a bracha (blessing) for Shabbat was originally instituted by women to prevent eating in the dark on Shabbat, because it was forbidden to light a lamp or kindle a fire on Shabbat. It was originally done without a bracha, apparently, but women took it on as a spiritual mitzvah, by looking to the bracha for Chanukah candles stated in the Talmud, over 1,000 years older than our current Shabbat blessing--and substituting the word "Shabbat" for "Chanukah." After the 11th century, lighting Shabbat candles had become a religious ritual with a bracha, done by the women, who were home to do it before the start of Shabbat while their husbands were still davening (praying) in shul (synagogue). No matter how it began, it is now a beautiful, meaningful ritual which touches the soul and brings peace and tranquility into the home.